UK – Thorpe Park Resort theme park in Surrey has recently been supplied with a complete EM Acoustics audio system based on the HALO-Compact line array system supplemented with MSE-218 subs, AD and AQ amplifiers and a number of just-launched M-C12 monitor speakers. The complete system as well as lighting equipment was supplied and installed by production solution specialists, White Light. 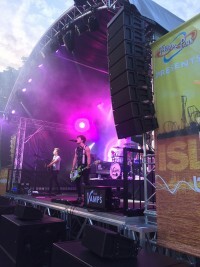 The system was purchased largely to cater for Thorpe Park’s busy outdoor events season which includes the monthly Ministry of Sound club nights and the Island Beats concerts over the summer. White Light’s business development manager, Jonathan Haynes, led the project. “After a number of on site product demonstrations, it quickly became apparent that the EM Acoustics system was ideally suited to their requirements as it provided the flexibility they required in order to handle the wide variety of events and functions held at Thorpe Park.” White Light supplied a full EM Acoustics system comprising 20 HALO-C line array elements, eight MSE-218 subs, three AQ-10 and 4 AD-9 amplifiers in addition to eight M-C12 monitor speakers. EM Acoustics provided comprehensive on site training for Thorpe Park’s technical team in order to familiarise them with their new system and to explain how it can quickly be upscaled for larger, one-off events. Indeed, the system can easily be supplemented by the hire of additional boxes from White Light’s rapidly growing rental inventory of EM Acoustics equipment.